Spanish/Mexican and Anglo-American cultural influences. Its picturesque streets and lanes, low adobe houses, beautiful Spanish colonial churches as well as the profusion of Native American arts and crafts andcontemporary art have long been a sightseeing attraction for tourists. 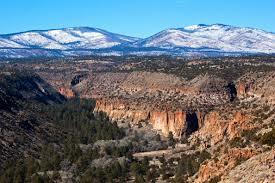 We will also visit Bandelier National Park which rests on the slopes of the Jemez Mountains and is famous for Ancestral Pueblo Indian Cliff dwellings.